This past Sunday I announced that Westside will begin a renovation of the first floor space of the Centre in 2015. The first floor is the street level space found below the Auditorium that many probably haven't seen. It is currently comprised of 12 dressing rooms, a laundry room, a wig/hair/makeup room, the trap room (large room under the stage used for storage), a work shop, and a couple of smaller general purpose rooms/offices. Basically a level dedicated to the production of large shows but not all that useful to us as a church. Let me give some history and information regarding this project. When Westside moved into the Centre in August 2013, we had in mind then to move forward with a renovation of the first floor space. With a renovation in mind, we secured architectural and engineering help and were told that renovation costs would total somewhere around 1.2 million dollars. To say the least, this was money we didn’t have and in turn we gave ourselves to moving into the building, paying off start up costs, and giving ourselves to the ongoing and very busy ministry, which at that time included the planting of another church (Christ City). This past August, after a year in the building, I put the renovation project back on my prayer and to-do list and began meeting with partners of the ministry to see about the possibility of raising the necessary funds to move forward. Long story short, after presenting our plans in December to some friends - true conduits of grace, those who sacrificially put their money where their hearts are - they agreed to underwrite our project’s costs. Let me say that one more time – after presenting our plans in December to some friends and partners in the ministry they agreed to underwrite our project’s costs! 1. 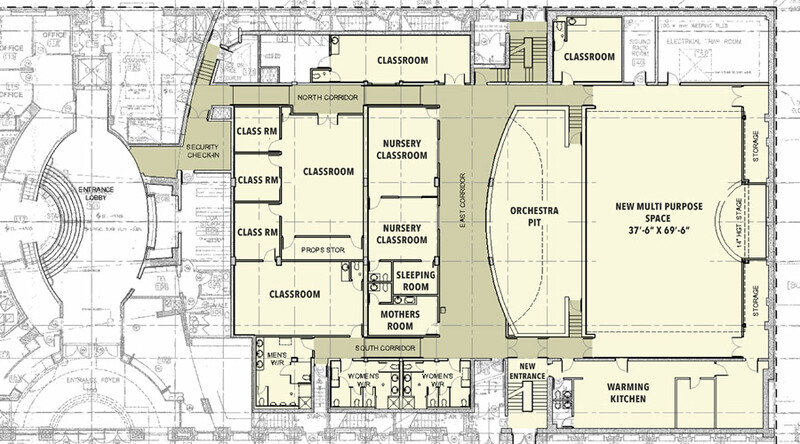 A renovation of the current dressing room space into multi-use classroom and training room space. These will be rooms used on Sundays for kid’s classes as well as during the week for training days, Bible studies, conference breakout rooms, etc. 2. A renovation of the “trap room” which sits under the stage. This is a huge work that demands concrete and steel reinforcement of the stage floor with sound barriers put into place. This part of the project will create a room that will accommodate up to 200 people for classes, youth events, worship opportunities and so on. 3. The building of a “warming” kitchen. This will be located in what currently serves as the volunteer room. This kitchen will allow us to host more “Westside Eats”, serve our “Bridging the Gap” ministry, and meet many other conference and meal needs. 4. The building of a secondary access door. Currently there is only one “main” door into the Centre. This works well most of the time but when there are several events going on at one time, especially when one of the events is a major rental like the Goh Ballet, Vancouver Film Festival or Melting Pot, it creates a huge conflict. Our plan is to build a secondary access on Homer Street, enabling people to enter the Centre for classes, youth, etc. without having to go into the main lobby. 5. Additionally, we will upgrade high traffic carpet areas in the auditorium as well as restructuring the stage. The Centre auditorium is now used almost 100 days a year more than it was when it was purchased. With that increase in use has come much wear in the auditorium, which was 22 years old to begin with. Additionally, we will be extending the stage further toward the seats making a more suitable teaching and preaching atmosphere. 6. Finally, there will be some cosmetic upgrades done to the office space in the basement. 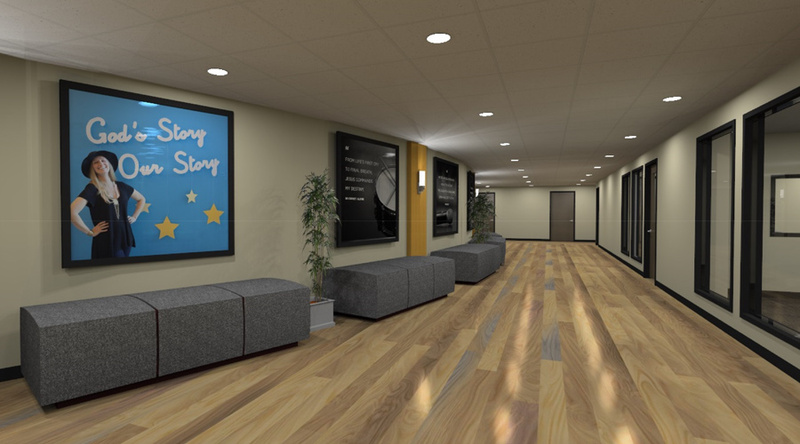 These upgrades will include some carpeting, painting, and removal of the current “institutional” look. Along with this upgrade will be the creation of “internship” space that will allow us to house more ministry apprentices and interns in the years ahead. 1. Why not spend this money elsewhere? Why not spend it on missions, for example? I couldn’t agree more–1.2 million is a lot of money–but what I try to remind people is that Westside, and churches like it, are the mission. The church doesn’t do missions, the church is the mission. Vancouver is dying spiritually and our desire is to make Jesus known here – this project allows us further opportunity to do that for the decades ahead. One of the reasons why we went to “outside” support for this project–and why they gave to Westside –is because they/we/I believe that this church is on mission and we want to continue doing what we are doing uninhibited by debt or space needs. This renovation allows us to do more helps ministry, training ministry, discipleship ministry, youth ministry, etc., etc., etc., without taking on any additional debt. Praise God! Additionally, and personally, I never lead with today in mind. Leading with today in mind isn’t leadership, it’s maintenance. I’m not a maintainer and therefore desire to lead thinking ahead to the next 3, 5, and 10 years. I lead with the hope that someone more gifted will take over. God forbid that I, and those I work with, are the best leadership Westside will ever have. This project has in mind the future and belief that Westside won’t be a two campus ministry of 1400 with two other churches having been planted, as it stands currently, but a church of 5000 with 10, 12, 15 others planted. I only lead that way. Whether that takes place, only God knows, but if I fall may I, and those I serve with, only fall on our faces and not our…well, you know. 2. Will this encumber ongoing rentals that use this space? No, it will be different for them, no doubt, but it won’t stop them from using the space by any means. Our desire is to continue renting this space and inviting those in our city to use it for the arts, film festivals, conferences and so on. However, this decision was made first and foremost with Westside and our mission in mind. Currently we are finalizing renovation drawings. Upon completion we will present them to City Hall to secure the permits which will allow us to move ahead. We have been told that permits could take up to 4 months to secure. If that proves to be the case then the renovation process would begin in late spring, which would mean a November or later finish. Favor with the City regarding permits. Smooth work with the renovation itself when it moves ahead. Westside, I love and thank God for you. I/we covet your prayers as we move ahead in making Jesus known here in Vancouver.